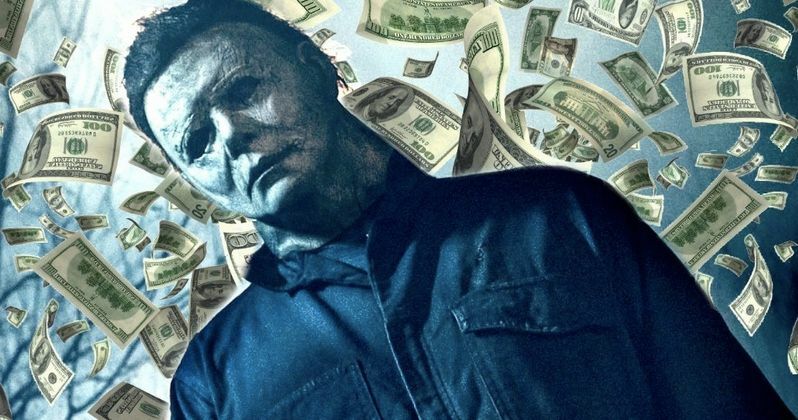 Blumhouse's Halloween easily scored the number one position at this weekend's box office. The impressive opening of $77.5 million domestically is the franchise's best by far, beating Rob Zombie's previous 2007 opening of $26 million, and also scoring the second highest R-rated debut behind Andres Muschietti's big screen adaptation of Stephen King's IT. It arrives as the second best October weekend opening of all time, just barely missing the record set by Venom a few weeks ago. Overseas, the horror film brought in an additional $14.3 million, making for a grand total of $91.8 million for the weekend. Blumhouse only spent $10 million to make the film, which pretty much guarantees that a sequel will be made. Following behind Halloween this weekend is A Star is Born and Sony's Venom, with $19.3 million and $18.1 million, respectively. The Bradley Cooper and Lady Gaga-led movie is continuing to be a box office draw, having earned $126.3 million domestically to date. While Venom took the third position this weekend, the film has been a monster at the box office having brought in over $461.8 million worldwide since its debut three weeks ago. Goosebumps: Haunted Halloween took the fourth spot this weekend with $9.7 Million. While it's impressive that the sequel stayed at number four this week, the movie has made significantly less than its predecessor. The promotional campaign waited until the very last second to announce Jack Black's involvement in the project, which many believe hurt its chances at the box office. Ryan Gosling's First Man continues to fall, having brought in only $8.5 million this weekend. The Neil Armstrong biopic has only made $55.4 million worldwide in the two weeks that it has been in theaters. The Hate U Give is continuing to impress at the box office and earned $7.5 million, taking the number six spot this weekend after opening in more theaters for an awards season push. To date, the movie has brought in $10.5 million. Smallfoot continues to hang out in the top ten, earning $6.6 million this weekend, which was enough to take number seven spot. The animated family film has brought in $137.1 million worldwide since opening at the end of September. Kevin Hart's comedy Night School fell from the number six spot to earn the eighth spot this weekend, with $5 million. The comedy has grossed $84.4 million worldwide to date. The number nine spot this weekend went to Drew Goddard's Bad Times at the El Royale, which earned $3.3 million. The Old Man & the Gun took the tenth spot at this weekend's box office, taking in $2 million. You can check out the rest of this weekend's numbers over at Box Office Mojo.